Husker Football First game is against BYU on September 5. 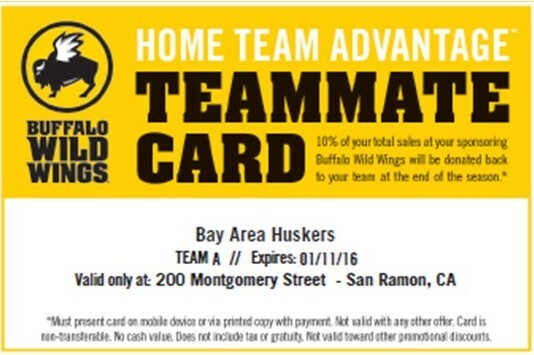 Join us at San Ramon Buffalo Wild Wings. Visit our Upcoming Events page. Deadline to order pizza is September 8. 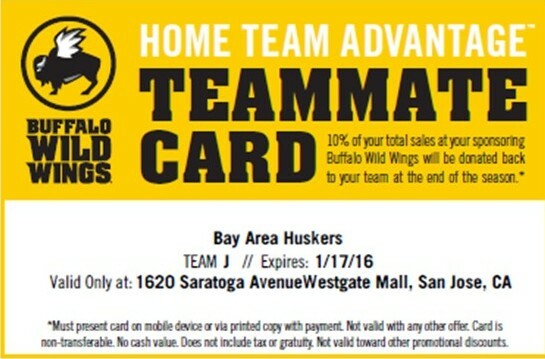 Here are the Home Team Advantage Cards for each of our Buffalo Wild Wings locations this year. 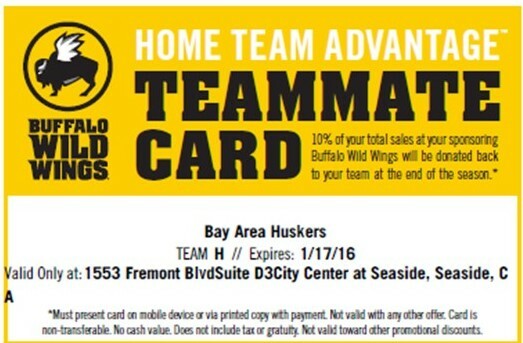 You may not need the cards every week, but is best to have them the first few weeks and make sure your servers are aware we have this set up for Husker Fans. The proceeds they provide back to us go into our scholarship funds. You can click on location link for the sheet and the card or the image below for just the card. Everyone is invited to come out to Buffalo Wild Wings in San Jose on August 22. 1620 Saratoga Avenue (Westgate Shopping Center) San Jose, CA 95129. Doors open at 9;00 am. Board Meeting is at 10:00 and everyone can attend as we will discuss the recent BBQ and activities going forward to include Taste of Nebraska. There is no breakfast, but Buffalo Wild Wings will serve coffee. You can order lunch starting at 11:00. There will be prize drawings donated by BWW. Bring this ticket and show to your server. I will be showing a video of pictures from the BBQ and past events and some Husker produced videos as well. There will be Bay Area Husker T-Shirts for sale and wear your red. We can also talk about the upcoming football season.